We can custom build to your portable needs, buy your generator and generator accessories for sale at factory direct prices. Visit your local warehouse or call us today! The single cylinder diesel engine is as economical as they come, only burning through 1.1L an hour on average. 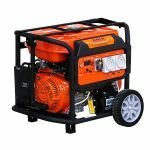 A portable generator provides a handy electrical power wherever and whenever you need it when the mains electrical power is down or not available at a job site or campsite. Built with a gas-powered engine (petrol or diesel) the genset engine turns an alternator to generate electricity, a more powerful engine can turn a more powerful alternator generating more electricity. What are Portable Inverter Generators? Inverter generators produce a cleaner and more stable power supply without spikes of current flows, making them safe for delicate electronics such as tv’s and computers and smartphones. Ideal for caravan and camping use. Inverter generators offer a number of other benefits, including less noise, lightweight design, and greater fuel efficiency compared to conventional generators. For more industrial machinery, check out air compressors, compactors, brick saws, portable pressure washers, air-cooled diesel portable generator, 21-55kVA Gensets sales as well as over 55kVA generators. We ships Australia wide including Adelaide, Hobart, Port Hedland, Karratha Gensets, Kalgoorlie, and Melbourne. Water cooled 8-20kVA generator, 21-55kVA generators. Australia grade Portable Generator Petrol Portable generator, Diesel Synchronised Gensets, Large Industrial Gensets. Choose a genset at very competitive rates. Visit your local Able Sales showrooms and browse the scope of trustworthy power machinery from trusted brands including ABLE, Kubota and Cummins. Our range of portable generators covers both diesel and petrol engines. Able Sales is Australia's biggest online selection of power gensets, 3 phase generator, 240v generator, and RV generator. Discounted portable gensets for tradesmen and portable generators for camping available at factory direct prices. "C60S Plate Compactor received today , started first go , in use already in back yard , no more..."
© 2007-2019 Able Sales Australia.